The prehistoric record of southern Africa extends back some 2 million years. The oldest cultural artefacts are stone tools such as handaxes, cleavers and choppers. In more recent centuries, archaeologists have found an extensive repertoire of artefacts including not only stone tools, but tools of bone, wood and shell as well as beads, jewellery, grinding stones, clothing, fishing equipment, burials and southern Africa’s enigmatic rock art. Understanding these painted scenes and menageries is not immediately obvious. Using this interpretive guide, visitors to these ancient shrines can properly interpret rock art panels and make sense of the complex world of Bushman beliefs. Bushman Rock Art is the first of its kind. 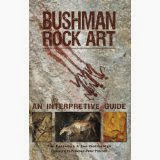 Never before has rock art been so dissected and presented in such an easy- to-understand, interpretive manner, exploring the deep symbolic meaning behind the art and what these powerful images meant to Bushman artists. The images they painted, all with exquisite attention to detail, have deep ties to Bushman cosmology and their religious beliefs. With a selection of images from across southern Africa, deciphering the painted sequence of motifs is simple and innovative, making it possible for the layperson to truly appreciate this phenomenal artistic tradition. Also included is a guide to rock art sites in South Africa, Namibia and Botswana.